Come visit us at the Ministry Faire, Saturday & Sunday, November 23 & 24. 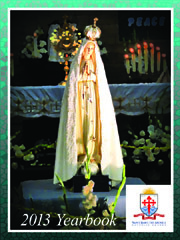 The bulletin is composed each week with contributions by Father Antony, Majel Cantoria, and John DiPaola. We welcome news and articles from parishioners. The bulletin PDF file is sent to J.S. Paluch Co. each week to be published. Carolyn Fiori, editor. Now accepting articles, photos and advertisement for the 2014 yearbook. Deadline for submissions: May 15 2014. Parish calendars will be available on the weekend of December 15. Pick up your box of donation envelopes and your 2014 calendar.Pick up one for your family!